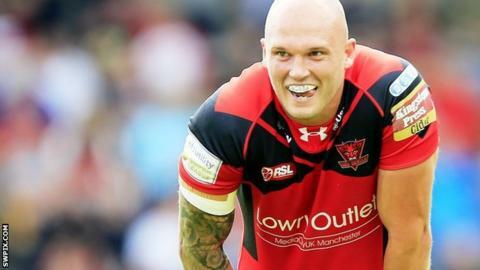 Salford secured their Super League status with a win at Widnes. Patrick Ah Van got the hosts back in it after Josh Griffin had put Salford in front but further scores from Scott Taylor and Cory Paterson put the Red Devils in charge at the break. Junior Sa'u extended Salford's lead after the restart before Lloyd White gave the hosts hope. Griffin and Vikings skipper Kevin Brown were both sent off late on after a fracas. Defeat for the Vikings means they must beat Leigh next week to ensure they will definitely be in the top tier next season. Salford face Hull KR in their last game of the season next Sunday with both teams guaranteed a place in Super League in 2016. Widnes: Hanbury, Ah Van, Dean, Runciman, Flynn, Brown, Mellor, Dudson, White, Gerrard, Clarkson, Whitley, Cahill. Replacements: Heremaia, Tickle, Manuokafoa, Craven. Salford: Evalds, Jones-Bishop, Thornley, Sa'u, J. Griffin, Lee, Dobson, Taylor, Tomkins, Tasi, Hansen, Maitua, Krasniqi. Replacements: A. Walne, Morley, Hood, Paterson.